The Bentley Continental is pretty much the epitome of ultra-luxury and performance wrapped into one convenient but expensive package. Bentley managed to build on that perfection and in 2013 released the Continental GT V8 S. Packing a gain of 21 horsepower, a revised suspension system, and relatively impressive fuel economy, the GT V8 S quickly became the object of affection of the wealthiest of the wealthy. Now, Mulliner has upped the ante a little more, this time using something known as Sparkle Carbon. We’ll talk more about this new material in just a minute, but before we do, let’s talk a little more about things in general. This special edition Continental goes by the name “Orange Flame,” and deservedly so, as one look at it will have you feeling just a little bit warmer inside. 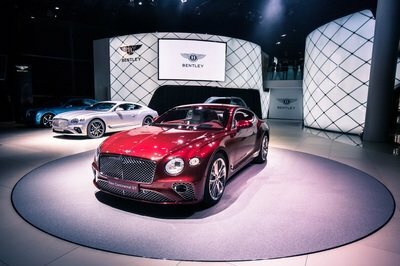 Keep in mind; that last phrase comes from someone who is excessively critical of any brand, like Bentley, that uses its name to garner as much money as possible because of its status symbol status in the hierarchy of all things on earth. Needless to say, I’m pretty impressed with this one. That said, let’s dive on in and cover the important details about this outrageous combination of colors and materials that somehow work together perfectly. 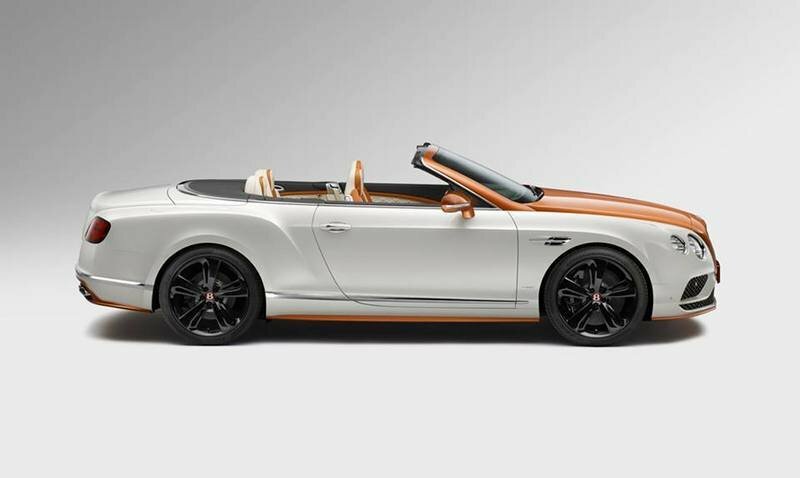 Continue reading to learn more about the Bentley Continental GT V8 S Convertible Orange Flame By Mulliner. 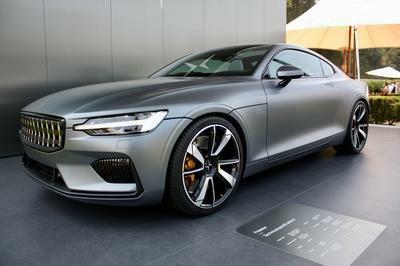 Let’s start off by talking about the boring part of this model: the exterior. The world boring might be a little harsh, but outside of a custom paint job, the “Orange Flame” hasn’t changed at all on the outside. Basically, the car has the standard “bodykit” for the Continental GT, which is pretty much a tiny like that surrounds the entire bottom of the car. This lip, along with the radiator grille surround, hood, side view mirrors, and the panels around the windshield all have an “Orange Flame” finish. The rest of the car is finished in white with the chrome garnish on the sides to give a little extra accent. The wheels also take on a black finish to complete the exterior package. The interior is where things get really intriguing. The “Sparkling Carbon” that I mentioned earlier is the highlight of the whole GT V8 S Orange Flame – not by itself, but collectively with the entire layout of the vehicle. 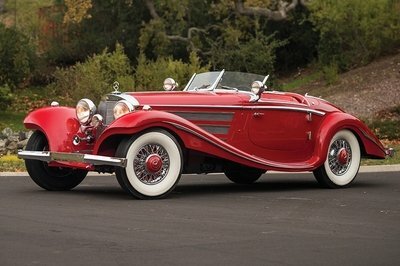 To make the new material, Mulliner took carbon fiber, copper foil, and metal wire and wove all three fabrics together. Once the materials are woven together, the material is cut to the needed size and shape, lacquered, and finally polished continuously until the “foil aspect of the weave emerges to showcase its natural reflectivity.” All told, it is most intricate and beautiful pattern that I think I’ve ever seen. The placement of these interior panels is, in itself, true art. It comes off as a bit of a surprise, but Mulliner didn’t get too wild when it came to applying these new panels. In fact, there are just for places where the new material is used. You’ll find it surrounding the instrument cluster, and on the face of the dashboard on the passenger side. The center stack got a gracious helping, where the material is used as a bezel to surround the center HVAC vents, radio, and HVAC controls. There is also a small helping farther back on the center console for good measure. Outside of this new material being placed in strategic spots throughout the cabin, the interior has an intriguing three-tone color scheme. The upper portion of the dash and doors are finished in black, while the lower portions are finished in Ghost White. These two colors are also found making up the majority of the steering wheel, seats, and center console. 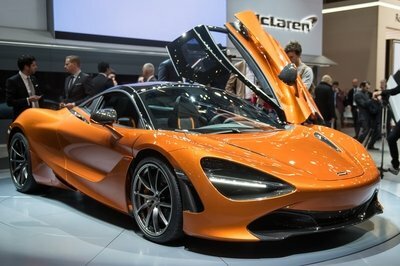 Orange is used to accent all four seats, the headrests for each seat, the sides of the center stack, the inside edges of the center console, and as a stripe at the 12 O’clock position on the steering wheel. 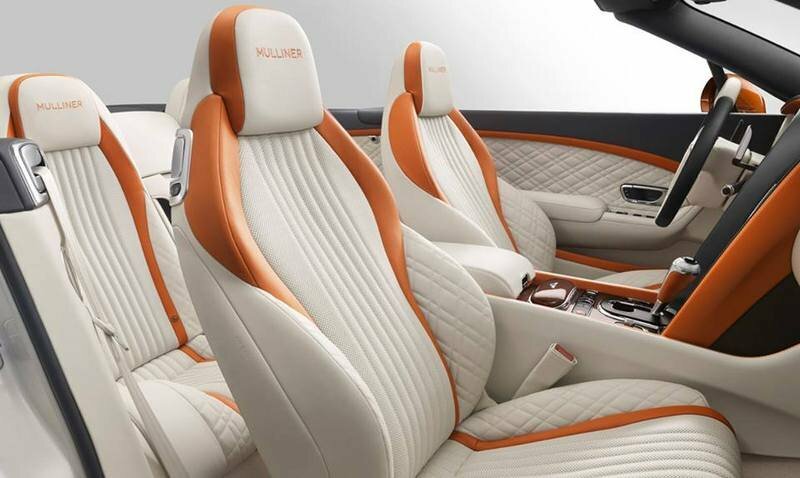 Furthermore, the headrest of each seat is embroidered with “Mulliner” in the same orange coloration. Normally, three-tone interiors are a little “out there” and often feel cluttered or uncomfortable because there is so much going on, but not here. When it comes to the Orange Flame there is just the right mix of each color; all applied in just the right place. It almost has a harmonious look and is very inviting. 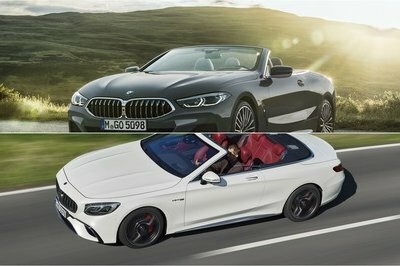 To top it all off, the car has that 4.0-liter V-8 with 521 horsepower and 502 pound-feet of torque lurking under the hood to go with a ZF eight-speed transmission and a 60-mph-sprint of 4.3 seconds. What’s not to love, aside from the overindulgent price, that is. 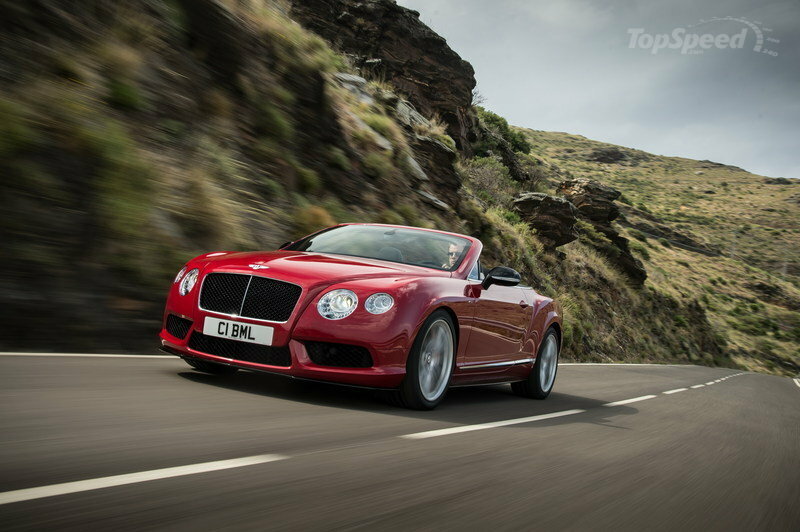 Read our full review on the Bentley Continental GT V8 S here.